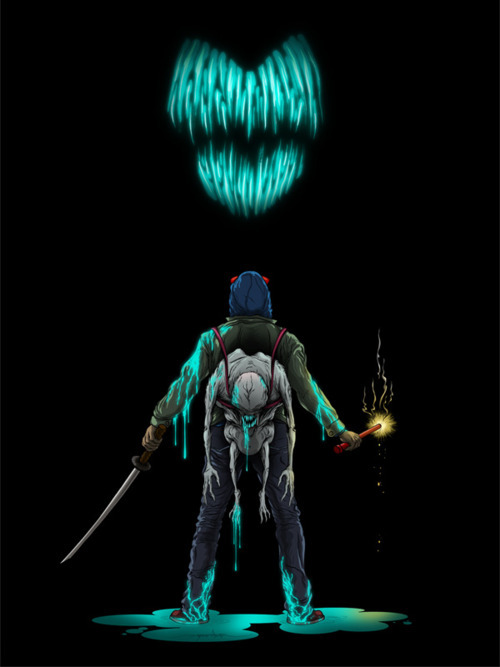 I’ve been kind of hesitant to tackle the recent hubbub about the possibility of Attack The Block expanding as an IP, as it’s clearly emerged as off-the-cuff fancy from the filmmakers, or mere “yeah sure, that’d be neat” answers at Q&As around NYCC. The one substantive piece to the whole thing has been director Joe Cornish and producer Edgar Wright alluding to actual offers from American producers for remake or even television rights to the film. As recently as (the nearly all-action) The Raid getting picked up for an American remake, we’ve seen the Hollywood tendency to reprocess good foreign films through the pale-face machine still going strong. So I suppose that is a real possibility and even if greenlights for alien films seem to have cooled a bit after a very lukewarm year for the trend, I wouldn’t be shocked to hear about a NY-based Attack The Borough or something. Not holding my breath though. John Boyega had this one brilliant image of Moses… John’s idea is that there’s another wave of aliens that come down, much bigger aliens, and in much greater numbers, and he has this image of Moses on the back of a police horse wielding a samurai sword and leading this army across the Westminster Bridge near the Houses of Parliament, kids on bikes and mopeds all massed behind him, all coming from South London to Central London to come and battle these aliens in the center of the city. —but again, this is all couched in “anything is possible” dreaming and “wouldn’t it be fun?” spitballing. Nothing real. Cornish even alludes to the 7-year gap between Alien and Aliens, suggesting anything like that would have to develop over time. I take that more as a subtle indication he’ll be moving on for good, frankly. Today is not a time when you’re going to get a sequel greenlit to a film that barely pulled a million bucks in the states, despite overwhelming hype online. Ultimately I think Cornish is going to continue to ride the goodwill of Attack the Block and the heat of being involved with Tintin across blockbuster short-lists until he finally hops on a big production that will seal his place as a new action director to be reckoned with. Sure, I would have love to see the film succeed but when the Blu-ray hits next week, it will be mine and no one will be able to take that away*. What’s more important is that a new, great filmmaker has been empowered to start a career that could produce an entire body of great work, and a promising young actor has been given a fantastic opportunity to grow. That’s enough of a happy ending for Attack The Block to me. *And speaking of that Blu-ray release, next week CHUD will be giving away something very cool in connection with the film… keep your eyes peeled.